On the occasion of the 20th anniversary of BICC on 10 April 2014, the Center organised the expert workshop “Conversion Studies put to the test—Base conversion in Germany and Western Europe”. 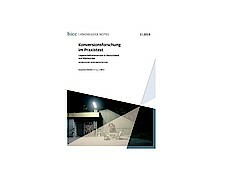 BICC Knowledge Note 1/2015 documents the contributions to and discussions of the workshop (in German). Presseerklärung "Neue Publikation - Konversionsforschung im Praxistest"